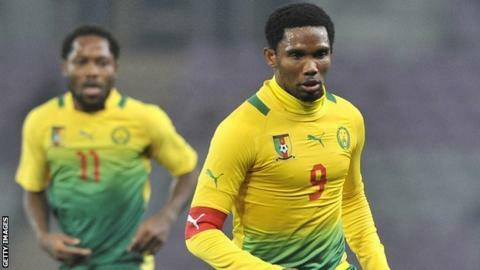 Cameroon coach Volke Finke refused to confirm reports that Samuel Eto'o has retired from international football. Chelsea's four-time African Player of the Year, 32, reportedly told team-mates that Sunday's 1-0 win over Libya was his last Indomitable Lions match. Victory qualified them for the African play-offs for the 2014 World Cup. "Samuel Eto'o is a great player and it is better that he should be the one to explain things. He is the one who knows his decision," Finke said. "He has given a lot to football and Cameroon and that is why he is the one to explain this." Eto'o, who joined Chelsea from Russian club Anzhi Makhachkala last month, did not attend the post-match news conference to confirm or deny whether he was retiring. But BBC Sport understands the striker wants to concentrate on his academy. Eto'o is also paying for treatment for former national coach Jean Paul Akono, who had a stroke earlier this year. After the win over Libya, Finke paid tribute to Akono, the man he succeeded as Indomitable Lions boss. "I present my greetings to Jean Paul Akono, who was responsible for the first three matches and the victory today," the German said. "This is something Jean Paul Akono participated in and he did a good job. I hope his health will get better." Cameroon will find out who they will face in the World Cup play-offs on 16 September, when the draw is held in Egypt.